For a long time, the Manfrotto 303 SPH head was the only spherical head on the market and it remains the most robust model since it can support easily a heavy body like the EOS 1DX Mark II or an equivalent. 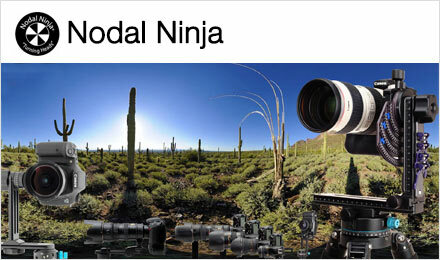 The Manfrotto 303 SPH panoramic head is a head called spherical. It can be disassembled into three or four parts which makes it a good equipment choice for transport and to put in your photo bag. This isn't trivial! More robust and stable than many spherical heads on the market, it handles heavy equipment like the Canon 1DX Mark II or the Nikon D5 better. Even if it seems to be able to handle more on the photos, it is only true on the photos because in real life, there can be wind! As a consequence, it is noticeably heavier than the average spherical head. 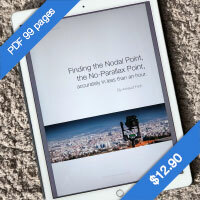 As for all spherical panoramic heads, it is possible to place it at the nodal point of the lens used in all directions. It is thus an universal head but be careful, even if the vertical arm turns over to photograph the nadir, it is less convenient than with other models of heads, as we'll see later in this page. The Manfrotto 303 SPH panoramic head (there are two other models: 303+ and 303 ) is thus a spherical head. It has a stage of setting in depth tiltable on a vertical arm. 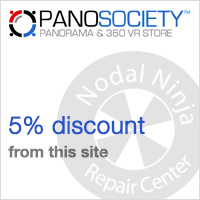 It is perfect to shoot a whole sphere and thus realize a virtual tour. The stages are of common dimensions or maybe a little longer than the average which makes settings easier even if certain settings will be a little bit bold maybe and will cause important overhang to the camera. Yes - in three parts - Head, one stage and vertical arm. 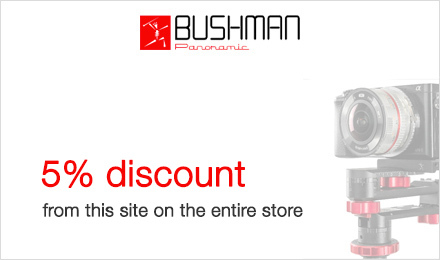 It is made of three or four parts with an overstage for point-and-shoot cameras, distinct and dismountable. Once mounted, it is quite impressive and still is ounce dismounted and put in a photo bag, especially because of the tilting clamping screw. Once the camera set, it is about 25 cm higher than the head. Its height alone being 32 cm from the base of the tripod. As you can see in the image here, its dimensions in width are quite important but it's not a defect when you want to photograph the nadir as we will see. We also clearly see that the vertical arm can be folded for transport and that it can slide on the lower reglet once unscrewed from below. Then, note that the clamping screw for the tilting head is quite big. It is convenient to screw but not to carry! And finally, it remains accurate, even after several years of intensive use apart from the notches that lost a bit of their sharpness and I find it more robust than many spherical heads on the market! 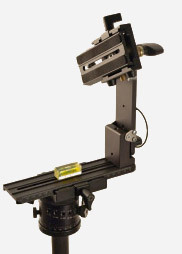 Once folded, the spherical head Manfrotto 303 SPH remains quite high because of its big clamping screw! Apart from the model Manfrotto 303 PLUS which stages are micrometric and can't be dismounted, the head Manfrotto 303 SPH can be dismounted in several distinct parts. 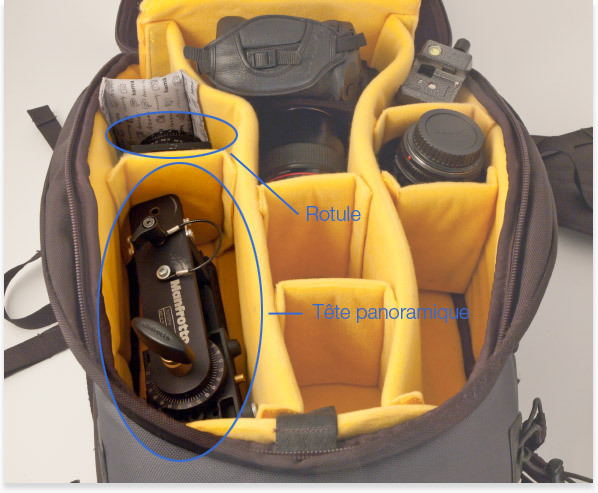 This is a precious asset to carry your equipment in your photo bag as shown in the image below. To remove the head that can be folded from its notched base, you just have to unscrew the clamping screw and make it slide by pushing on the golden blocking ergot at the same time. Once folded (photo above), I leave the upper sliding stage and put it all in a space long enough, the one for my 300 mm F 4.0. In another space I put the notched base, place for light accessories. 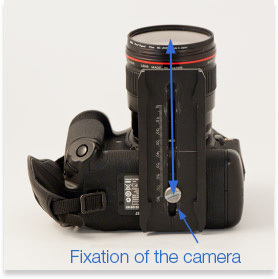 The Manfrotto 303 SPH, when it's used with a reflex camera HENCE which fastening screw under the sole is in the axis of the lens, can indeed be fastened directly on the upper stage, without overstage and this way, the head can be dismounted in two separate parts only. Handy! 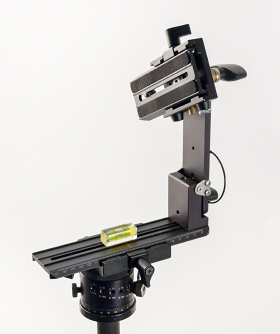 The Manfrotto 303 SPH panoramic head can be completely dismounted in two parts (without leveling base level 338) and can be put very easily in a photo bag this way, apart from the fact that you need a wider space than for the cylindric head 303. Once dismounted, the Manfrotto 303 SPH head can be dismounted into: a notched head (1), a stage sliding on 19 cm and a vertical arm (2) and a stage sliding on 12 cm in depth (3). 1 - Notched rotary base (1) - It's on this part that we'll be able to rotate the panoramic head of the number of degrees we need between two consecutive photos without looking into the viewfinder. Thanks to a wheel (the biggest held by a safety cable), you can choose the number of notches you need. When you turn the whole block, it will slightly block on the next notch. It's easy to feel... except after several years of use! 2 - Bottom stage and foldable vertical arm (2) - The whole thing enables to keep the camera vertical in order to get the highest panorama possible in pixels. The framing is done by the focal. Tip! The bottom stage comes into the base (1) and the vertical arm, once unfolded, receives the stage of setting in depth on 12 cm (3). 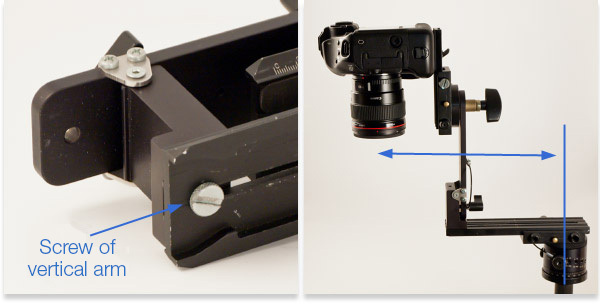 3 - Sliding stage (3) - The upper stage on the Manfrotto 303 SPH supports the camera when it's a reflex. 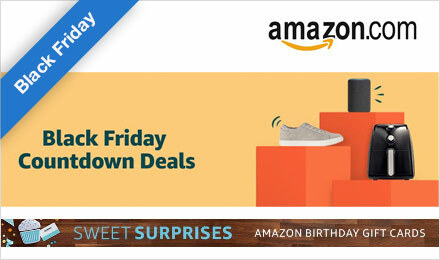 It slides on 12 cm. It comes directly into the base of the tiltable vertical arm. Piece of advice! Even if it's technically possible to use an even longer stage, I don't recommend it, except every once in a while, because the overhang is so important then that the head shakes a lot under the wind and has trouble stabilizing. Technically possible doesn't mean recommendable! The notched base has three clamping screws and three mobile parts rotating on 360° that we'll see in details now. 1 - The upper plate - Where the first stage sliding in width is fastened. 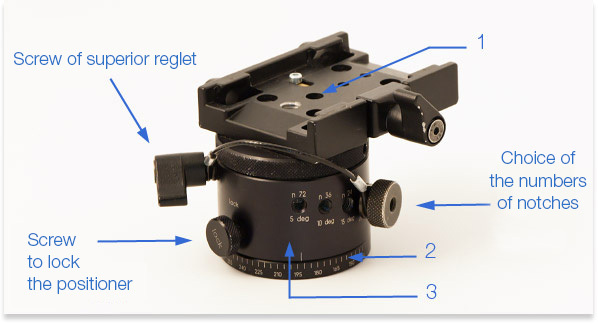 It enables to draw the area of the entrance pupil of the lens back above the rotary axis of the panoramic head. What's its use? The plate (1) can't be dissociated from the central part (3) if you screw the "upper plate clamping screw". The whole head rotates on the notches of the central part. - You place your head on a notch and when you look through the viewfinder you can see that a window or a singular object for instance is a the edge of the field - hence in the stitching zone -. It is then possible to temporarily dissociate the plate (1) from the central part (3) by unscrewing this "clamping screw of the upper stage". You just rotate the plate of your head a little (1) for the window to be at the center of your photo then you re-associate again the plate and the central part by screwing this screw. It is very convenient, and even more appreciable considering that you don't find that on all the heads on the market, far from that! 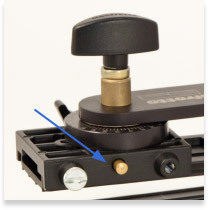 2 - the central notched part - The notched base Manfrotto 300N is notched every: 5, 10, 15, 20, 24, 30, 36, 45, 60 and 90°. It covers a large number of cases. This choice can be made using the big screw secured by a rope "choice of the number of notches". As time goes by, the notches are less "marked" than originally. 3 - the inferior plate - It indicates the rotation of the head in degrees. It is thus an indicator that isn't really useful on a notched base! How to do that? 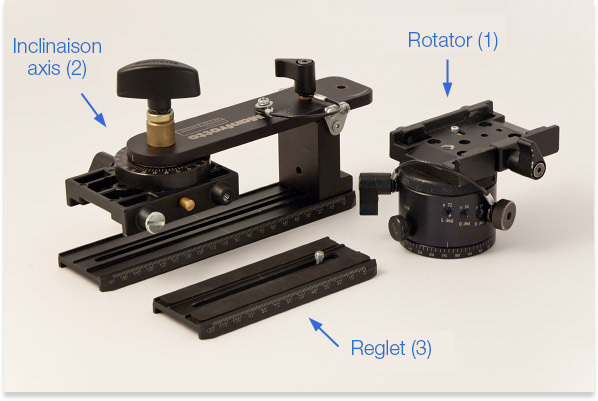 To unscrew the whole rotary base of the tripod, you need to separate this plate (2) from the central part (3) : this is done screwing the screw "Lock", at the bottom left "Blocking the base". 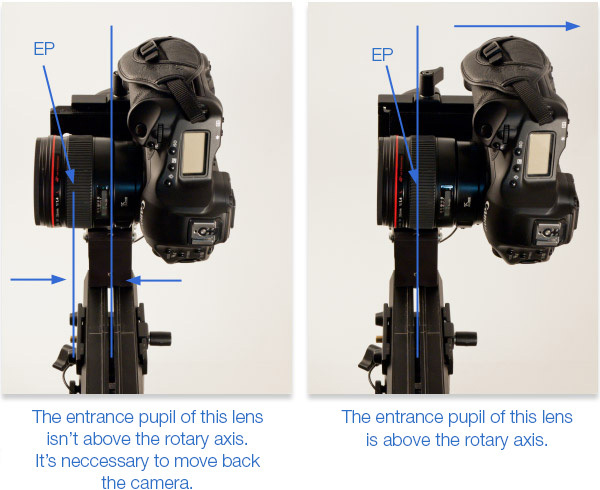 Like all panoramic heads, the Manfrotto 303 SPH is used to place the entrance pupil of your lens above the rotary axis of the head and in the tilting axis of the vertical arm to get perfect overlap zones. This head being a dismountable manual head, its functioning is very simple. 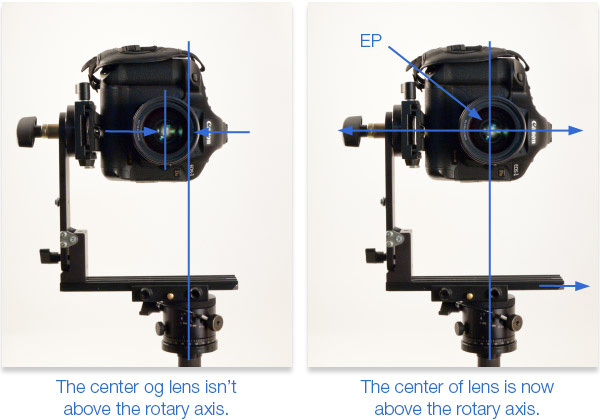 1 - The fastening of the camera is in the axis of the lens (most common case with reflex cameras): you just have to fasten the camera directly on the upper stage and it will all end up in the tilting axis. The nodal point will thus end up above the rotary axis BUT also in the tilting axis. (image over there). 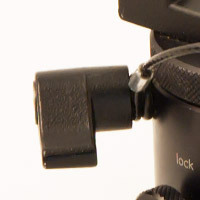 2 - The fastening is shifted from the lens: it sometimes happens when you mount a booster on a reflex but above all, it's almost always the case with point-and-shoot cameras. You then have to install a second stage perpendicularly (sold in the 303 SPH kit) to the upper stage in order to slide the body in height and thus align the center of the lens with the tilting axis. Once it is done, you have to find the setting in depth depending on your lens and if it's a zoom lens, you need to find the settingS depending on the focals you use most. This is done with the upper stage, quite simply! The entrance pupil is thus perfectly set on all axis hence in 3D on this panoramic head for this lens. You just have to mark the settings, below. Once the settings made for your lens, you just need to remember them for the younger among us, or more safely write them down in a notebook for the others (!). Who said I was making notes??? On Manfrotto heads in general and on the head Manfrotto 303 SPH in particular, you mark using the marked reglets.You can as well place a piece of tape as marker if you don't want to take your notebook out all the time but only if you always use the same lens and the same focal. The marks are not very legible so you'd better place a piece of tape. When you're trying to shoot a complete sphere in order to realize a virtual tour and if you want to get the best possible quality, you'd rather shoot the nadir leaving the camera on the panoramic head to keep it as close as possible to the entrance pupil but also, of course, to be able to shoot photos with long exposure times. This screw is very well clamped when it comes out of the factory so you'll need a big screwdriver to unscrew it the first time. Anticipate it before going in the field! 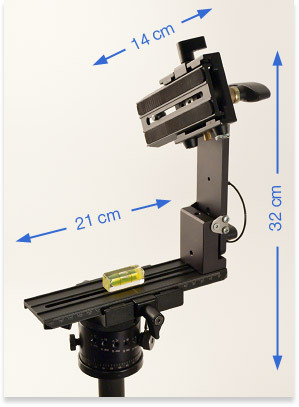 The great length of the inferior stage enables to take the camera away once tied above empty space as shown in the photo above, to avoid shooting the arms of the tripod. It's a real asset to shoot the ground only. Caution though, with a heavy camera as in this photo, it shouldn't be windy at all if you don't want camera shakes. Trust me! Nowadays, the Manfrotto 303 SPH head isn't the only one in the competitive market of spherical heads anymore. It's still a safe bet according to me when you use a quite heavy camera and lens. 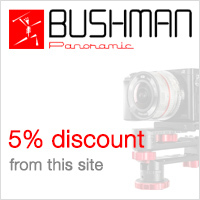 I still favor it for its stability when I shoot gigapixel virtual tours with my Canon 1 DS Mark III and a 50 mm F1.4 lens. However, since it is really less convenient to turn the vertical arm over than on a Nodal Ninja for instance, I don't use it much with my Nikon D7100 and its Nikkor 10.5 mm Fisheye. As a conclusion, I love this head for gigapixels but I choose more convenient and lighter ones for more conventional (eight photos) virtual tours. Settings of the notched base. Finishing quality a bit "rough"
Would need to be refreshed by Manfrotto!